And the G7 had some significant moments, particularly with regard to moving exchange rates in the 1980s. More broadly, behind the scenes, it served as a communication mechanism between the world's largest economies ("coordination" is a dirty word in G7 policymaking circles). And it was probably a good thing in the 1990s that Russia wanted to join the G7--hence the G8 once a year, although many of the most important technical meetings are just the G7. But today, honestly, what's the point? The L'Aquila summit seems likely to achieve nothing, i.e., nothing that could not have been agreed upon in a conference call among deputy ministers. Just because there's a communique does not mean it has any real content. Does this kind of expensive pageant make politicians today look important or frivolous? 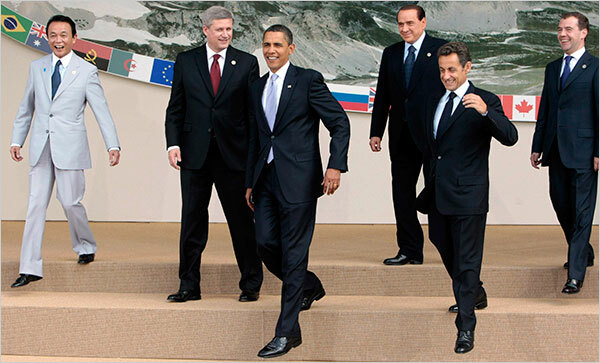 More broadly, three longer-run shifts mean the G7/G8 is increasingly anachronistic. First, emerging markets have obviously risen in both respectable clout and ability to make trouble. China's exchange rate policy is a leading example, but think also about Mexico, Brazil, or India. Having a global economic discussion (e.g., on climate change or aid to Africa) without these players fully at the table does not really make sense--particularly as the G20 now operates effectively at the heads of government level. And inviting these countries to a dinner or other event on the fringes of the main meeting just adds insult to injury. Second, the Europeans are now organized into a loose political union and all of the major economies--except the UK--are in a currency union. What is the point of sitting down with Italy, Germany, France, and the UK separately? It is much more effective when they--and other Europeans--work out common positions and bring those to the table collectively. The European Union belongs to the G20 but not the G7. Third, the idea that the U.S. and its allies "lead" by any kind of economic policy example is plainly in disarray. The recent crisis focuses our attention, but we've seen two or three decades with irresponsible credit and throwing fiscal caution to the winds across these countries. These countries traditionally position themselves as "G7 models" worth emulating; this message needs to be toned down. President Obama obviously has a talent for diplomacy (e.g., at the April G20 summit). He should use the Pittsburgh G20 summit in September to transition away from the dated emphasis on the importance of a G7/G8 heads of government meeting (e.g., reduce the excessive display of nothingness, lower the hype, have it feed into the G20 more explicitly). Canada, chair of the G7 next year and usually very sensible on these kinds of issues, can help. The G7 is still a useful forum for senior staff meetings on some technical issues, but it would be much more appropriate and effective for the high profile pinnacle organization to be the G20, not the G7.